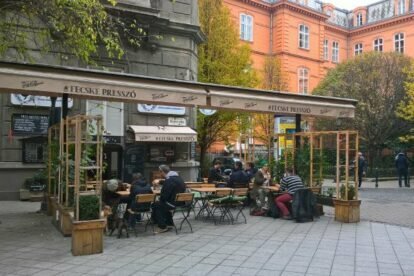 Fecske is kind of the perfect spot for students who just want to eat or drink something before, after or during studying at the nearby Szabó Ervin library, which they will be doing a lot, considering the semester has started again. The decor is really cosy, you can sit next to old posters, books, typing machines – just like at home! In autumn and wintertime, they offer all kinds of warming drinks: coffee or tea of course, but also hot cocoa or grog, and even their famous hot lemonade! Coffee is for takeaway too, and in the morning it’s cheaper – so pass by if you can!